I’ve been knitting like a mad woman lately. I finished a poncho for my sister for her birthday, a beret to use as a stool cover, a pair of fingerless gloves (my first! ), am working on a scarf for Peep #1 for his birthday and a pair of socks for my SIL for hers. I love knitting socks and try to have a pair going at all times. 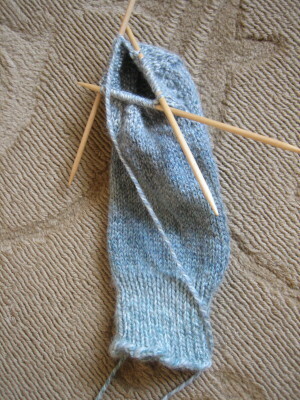 Below left is a picture of SIL’s sock, though I have made quite a bit of progress on it since this was taken. I’m on the foot now, about to start the toe decreases. he’s outgrown them (Peep #1 has benefited from these cast-offs) . 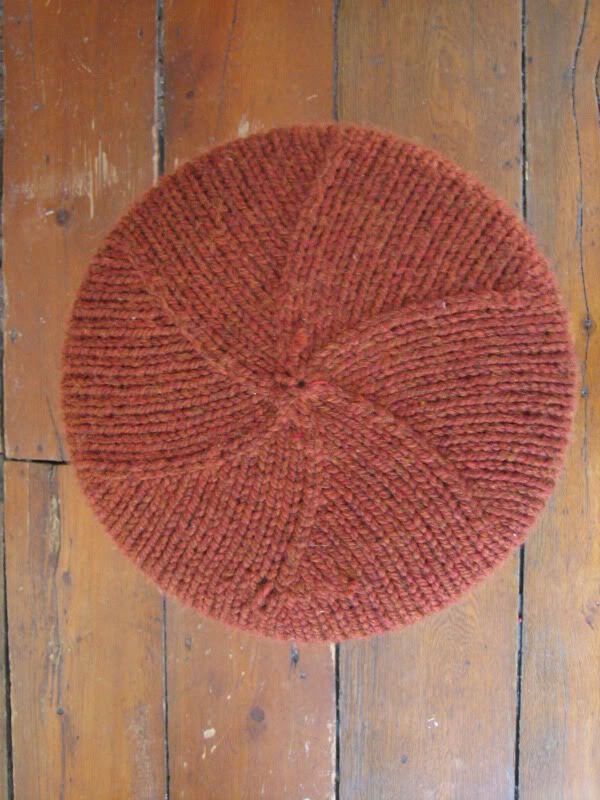 I also knit a beret to use as a stool cover that came out really cool. 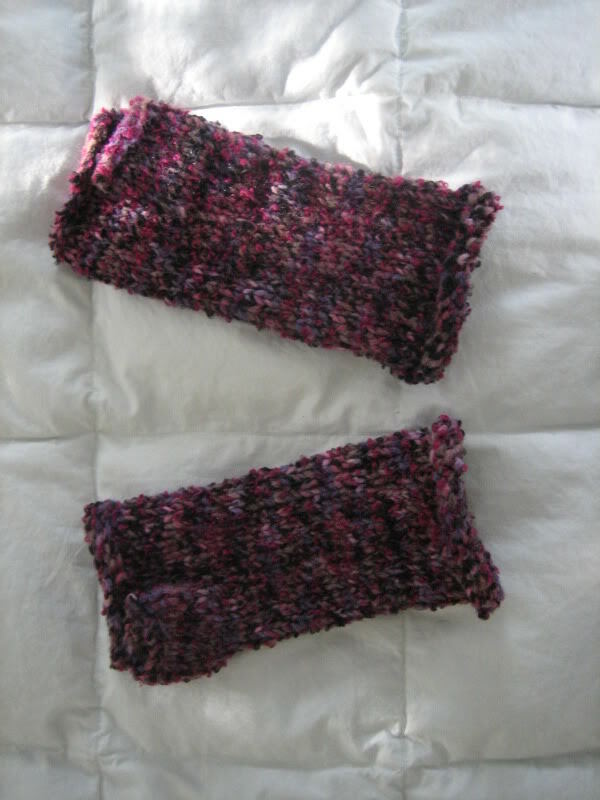 I used a really thick yarn (Wool-Ease Thick and Quick in “Spice”) and size 13 circulars so it knit up in a few hours. It’s perfect! Thumbs! I’ve mastered the thumb… it’s a huge knitting hurdle for me and you have no idea how exciting this is! (Unless, possibly, you’re a knitter and have experienced a similar thrill). I’ve been wanting to knit mittens and fingerless mitts for eons but was always intimidated by the thought of doing a thumb. I felt like knitting it flat and sewing it up was cheating. I was going to knit it in the round, dammit! LOL Anyway, I found a really easy pattern in Interveave Knits that I was able to modify. I used super chunky yarn (Sirdar Stampada) and size 10 DNPs. These knit up quickly as well– also in a couple of hours. Now I can’t wait to start whipping up a bunch of them to give as gifts at Yule. Peep #2 has been asking me for pair for the longest time (which is why I knit the “finger” area so short–see photo below), and I am just busting to give these to her! Her birthday is next month so I’m going to be patient, and in the meantime I’m going to start up a pair for myself on the sly…. This entry was posted in Knitting and tagged knitting. Bookmark the permalink.